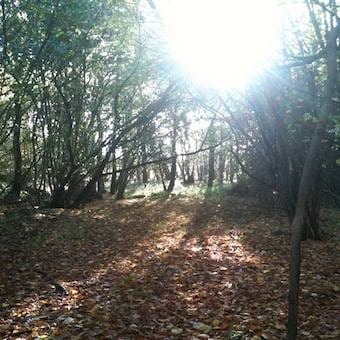 Step into the woods for a nourishing day of gentle movement to harmonise your energy with nature's autumnal drawing in. 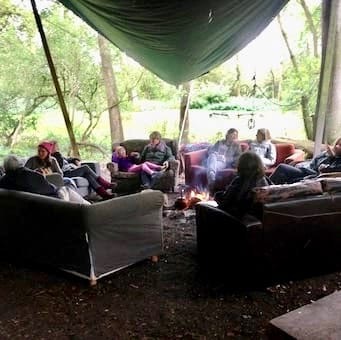 Extra delights include friendly female company, relaxed conversation and delicious homemade soup and cakes in comfy sofas in the rustic woodland shelters. As nature dims her Summer lights and slides into Autumn, I can't think of any more perfect way to align my energy with the seasonal shift than spending the day bathed in the aura of these ancient trees. At this precious time of year, the trees are pushing their waste into their falling leaves, so they can refine their juicy sap and draw this essence down to their roots to be stored and replenished over the Winter. 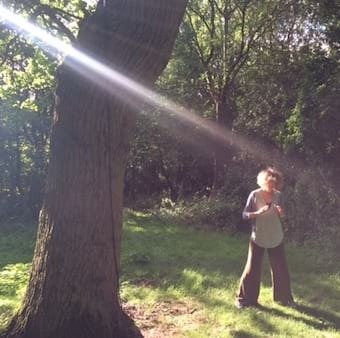 You too can tap into this autumnal energy of refinement, by shining an honest mirror on your life and clearing from it what no longer belongs so you can nurture instead the juicy essence of your truest self. 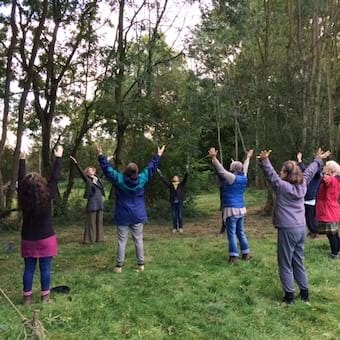 Our movement and stillness, reflection and sharing on this Qigong Day Retreat in the woods will give you the chance to do just this, so that Autumn's reflective drawing inwards feels like a supportive hug, not a suffocating squeeze. Do come to recharge in these magical woods. Qigong is a Chinese healing art combining movement, breath and focused awareness. The gentle movements are accessible to all, practised standing or sitting on a chair. Just wear warm, comfortable clothes. 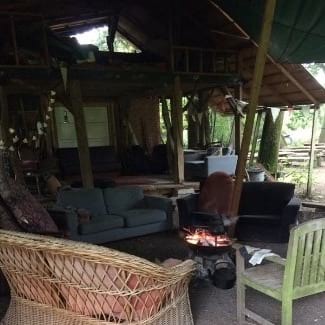 (using the ample shelters and enjoying the fires even more if it is wet). I'd love it if you could bring a homemade sweet or savoury snack to share. (Delicious soup and bread is provided). 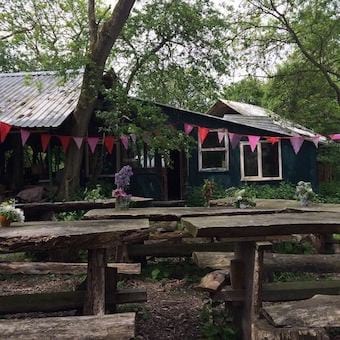 The venue is 20-minutes west of Cambridge. I'll send you directions and other information after booking. If you need to find a lift to my Autumn Qigong Day Retreat, let me know. What is WomenWell in the Wild? WomenWell in the Wild was set up by Filipa Pereira-Stubbs in the autumn of 2011. 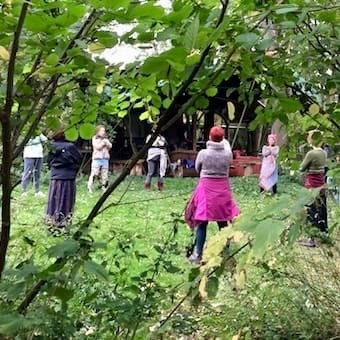 "It is a programme of arts workshops for women to be together in community and in playfulness in peaceful ancient woodland and fields through all seasons and all weather. Workshops run for women, by women – nourishing life-long learning in the arts and practical skills. Workshops so far have been in singing, poetry, and weaving - all led by established Cambridgeshire artists. We move through the seasons, slowly building in new workshops and inviting new women artists to share their skills and passions with others. 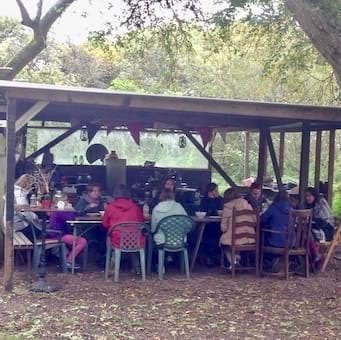 It feels important that workshops are repeated annually, life circumstances allowing, so that women who miss a workshop have the opportunity to do it again the following year."